Below is just a small selection of testimonials from our many happy customers. Please see our Facebook page for a full list of landscaping reviews and recommendations. A huge thanks to the Marshalls team for doing such an amazing job on our garden. Chris and the team were absolutely brilliant, they completely ripped up our garden to start from scratch and they managed to create our perfect garden in 2 days! Hayley was fab, keeping us completely up to date throughout from our initial enquiry to the finish point. We can’t recommend Marshalls Landscaping enough. We’re so pleased with our garden and perfectly timed to enjoy this summer! Thank you again so much guys! Very pleased to review Marshall’s, a fantastic job and most importantly very good communication before and during the job. The entire garden was completed in just 2 days, I really couldn’t speak any more highly of the team. We didn’t have to worry about anything at all. Huge thanks to Chris and his team. Five stars all the way! Can’t recommend the Marshalls’s team enough! Chris had some great ideas when he saw our odd shaped back garden but was very open to the ideas we had as well, even when we kept changing our minds about what we wanted. We ended up going for a more angular look to go with the angles already in the garden and couldn’t be happier. Chris was able to fit the work in earlier than planned and he and his team worked tirelessly in very hot weather to get the whole job done in just three days. They all work from dusk ‘till dawn and just don’t seem to stop, and the standard of work is amazing! Just a week ago we had a large patch of mud and dust outside, now we have a beautifully landscaped, modern garden that we just want to sit out in all the time. We wouldn’t hesitate to use them again or recommend them to anyone else looking for a fantastic company to turn their garden into something special. I had a relatively small job installing a new patio with a limited budget. Chris and Hayley were very helpful throughout, very professional yet engaging. They guided me through my options, and the work was scheduled much quicker than I thought it would be. The guys did a stellar job even with Storm Gareth moving in. It looks fantastic, well chuffed. Thank you to Marshalls Landscaping for transforming our back garden from what my dad described as a small meadow to a beautiful three tiered garden with patio, area of grass and flower beds. The organisation from start to finish has truly amazed us and the time it has taken was no time at all. The guys have worked extremely hard and all credit to Chris and his team for producing exactly the garden we asked for and more. Thank you again. The whole experience with Marshall’s Landscaping was fantastic. When Chris first came to quote, his ideas for our garden were similar to what we had been imagining, only better. He had a great portfolio of photos, so we could choose exactly what we wanted. A detailed quote was provided within days. We had a sloped garden, which Chris and his team terraced, giving us an expanded patio, a flat lawn and raised beds all around the garden which were planted beautifully. They also did some work to tidy up our front garden. The team worked tirelessly, pretty much from dawn til dusk, finishing the large scale project in just a few days. We were very impressed. There were a couple of small snags but these were corrected quickly and without fuss. We are absolutely delighted with our garden and wouldn’t hesitate to recommend Chris and his team! I don’t even have the words to describe how happy we are with the work chris and his team have completed. We have a new build property with a relatively small but extremely uneven garden that sloped downwards; we haven’t been able to use it much within the last 2 and half years. Chris and his team have transformed the garden within the space of 11 hours (1 day) and now we as a family with a baby who is growing up rapidly can enjoy our garden due to the amazing, professional and high quality work carried out. Can’t thank Marshalls landscaping enough. We would definitely recommend. We have just had our garden done and couldn’t be happier with the way it looks! The quality of the work is outstanding and finished to the highest standard. We found Chris very helpful and professional with great attention to detail, from the very first visit to the completion of our project, and Hayley was great at responding to any queries we had. Thank you so much to Chris and all your team. We absolutely love our new garden, the space is so useable and exactly what we wanted! What an exceptional job Chris and his team have done. We have a new build and the back garden hasn’t been touched for two years. They have successfully transformed what was essentially a mess into an outdoor living space to be proud off. We had a large curvy patio laid as well as turf and we could not be happier with the final result. Would highly recommend. We couldn’t be happier with Chris and his team. They were extremely efficient. From the first moment when we met Chris, we knew he was the one for the job. He’s got great ideas, and he is was really helpful and realistic with our ideas. Our garden was done in four days! In this short time the garden was excavated, made into three tiers, turfed, plants were planted and it was paved too. It was left all perfectly clean also afterwards and no dirt was left behind. This was in November, which is impressive considering the amount of rain and mud around us. I just can’t wait for summer to have a bbq in our garden and show it to all our friends and family. It really compliments the house now and after a year since moving it finally feels like home. Thank you! We are thrilled with the work that Chris and his team did in our garden. Chris helped us to design exactly how we wanted our garden to look, and even better, how to make this work around our budget. They are very professional and incredibly efficient. We couldn’t believe everything was finished and tidied away by the time we got home from work the same day that they started. A massive thanks goes out to Chris, Hayley and the guys. Chris and Hayley are a small family company and work exceedingly hard to deliver the customers expectations and especially in our case they definitely delivered. I was worried about any aftercare but had no reason, as nothing was too much trouble for them. Our garden looks out of this world. 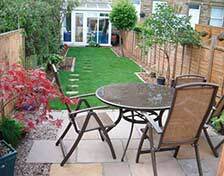 I have read many reviews from many other landscapers and had my concerns on paying a lot of money to plan and share ideas with fully landscaping with both front and rear gardens and to get this right. 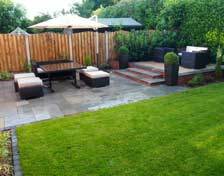 I can wholeheartedly assure anybody wanting a professional & friendly company to carry out any work, you can do no better than put your trust in Marshalls Landscapers Wakefield. I can’t recommend Chris and team highly enough. From the first meeting, Chris really listened and got what we wanted. It wasn’t straightforward as we were dividing a shared area with our neighbours so he had two tricky customers to deal with but the communication and service we received were second to none throughout. After we had agreed a plan for the gardens, there was a long lead time which was difficult as we were impatient to get things started, but now it’s done I can definitely say it was worth the wait. We could have got it done sooner and probably more cheaply but I’m sure it wouldn’t have been done to such a high standard. When the team started work they were incredibly efficient, completing the job much more quickly than anticipated despite some poor weather and always conducting themselves professionally. In short, if you need your garden doing, get Chris round and his professionalism and engaging manner will speak for itself! We are delighted with our new garden. Chris’ great design ideas, attention to detail, hard work and professionalism have made our garden better than we could have imagined – the transformation is unbelievable! It’s such a calm and relaxing place to be now. It’s refreshing to find someone so passionate and committed to his work. He continually updated us and worked with us every step of the way to make sure we were happy with how things were progressing. We will certainly use his services again in the future and have already recommended him to friends and family. This team of guys had both a professional and friendly approach to creating this garden. They listened to our ideas and offered advice to make the design come to life. I would have no difficulty in recommending this team to friends. We just wanted to say a big thank you for transforming our garden. 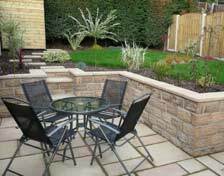 You have given us exactly what we wanted from our requirements and we would happily recommend Marshalls Landscaping to anyone. Your knowledge and professionalism are a credit to you. Thanks again. Thank you. I’m so pleased with the garden. Its exactly the kind of space we wanted to create. Your interpretation of our ideas was spot on. We have been really happy with the work carried out by Chris. He carries out his work with a great deal of professionalism and takes the time to ensure it is to the customers satisfaction. Would definitely recommend. I’d be more than happy to recommend your services. With fantastic attention to detail, hard work and excellent communication with us, nothing was too much trouble. I’m sure we’ll be having you back! Thank you so much for creating our beautiful garden, and taking the trouble to carefully tweak your designs so that they exactly matched what we had visualised. Just a quick note to thank you again for everything you’ve done. The paving has been installed with fantastic attention to detail and the planting compliments it perfectly. We are so pleased with our garden – I can’t believe how much more we use it now that its an enjoyable place to be. The water feature is just stunning. Thank you! Thank you so much for the work you’ve done, its amazing the difference just a day of clearing and planting can make! It looks like a different garden! We are really impressed!